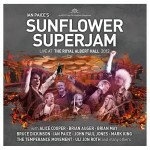 Share the post "Album review: IAN PAICE’S SUNFLOWER SUPERJAM 2012"
The Sunflower Jam was started back in 2006 by Jacky Paice, wife of Deep Purple drummer Ian Paice and sister-in-law to the late Jon Lord, as a charity event to raise funds for holistic and non-toxic treatments for cancer and other diseases. They always get a star studded line-up and the 2012 show was no exception, one that was tinged with sadness as it followed the death of Jon Lord. This set has been available as DVD package back in 2013 and now you get the added bonus of a CD of the set, although with fewer songs than on the DVD. Up and coming UK rockers The Temperance Movement opened the show with their cracking blues/hard rock on ‘Ain’t No Telling’. The band also pop up throughout the show as backing musicians and really get into the music and the whole event. Steve Balsamo performs a moving ‘Pictured Within’, a wonderfully moving song and suited to his vocals. How this man isn’t a better known vocalist is criminal. Mark King runs through two Level 42 hits, namely ‘Something About You’ and ‘Lessons In Love’. Never was a fan of Level 42 although fair play these two versions are very enjoyable. Brian May and Kerry Ellis do a sterling version of Rainbow’s ’Since You’ve Been Gone’, a song that Brian May used to feature in his solo set when he toured back in the 1990′s. Alice Cooper does ‘Elected’ and ‘School’s Out’, with a backing band including Micky Moody, Brian May and many more. Alice Cooper is the perfect showman, although his vocal is a little rough on here perhaps he was under the weather, however his stage presence alone carries the songs along. Bruce Dickinson’s highlight has to be ‘Black Night’ where he ‘dee dums’ out the tune to start it off and then gives his air raid siren vocal a good work out. What a rhythm section with Deep Purple’s Ian Paice and Led Zeppelin’s John Paul Jones. Oh and marvel at the Hammond organ solos of Brian Auger, fantastic stuff. ‘Smoke On The Water’ closes the show and is a real superjam with all the musicians back on stage. Alfie Boe steals the show with his tenor voice soaring over the music, he would ideal for a covers album of metal classics methinks! This entry was posted in ALBUM REVIEWS, ALBUM REVIEWS (Mobile), All Posts and tagged Alice Cooper, Bruce Dickinson, classic, Deep Purple, Ian Paice, Level 42, Mark King, metal, review, rock, Royal Albert Hall, Sunflower, Superjam, The Temperance Movement. Bookmark the permalink.